The Leather sisters — Christian Dior Diorling, Estée Lauder Azurée, Piguet Bandit, and L’Artisan Dzing! — lived together in a large house in a neighborhood that used to be popular before everyone moved across town to Fruity Floral. On the mantel was a photo of their father, Knize Ten, who was on a business trip to England talking with the Bentley upholstery people. Next to it was a photo of their mother, Lanvin Scandal, who had been discontinued years ago. “A monkey? Absolutely not! There’s no way we’ll have a stinky little monkey running around here. What would the neighbors say?” Near Diorling was a bowl of plums and a vase of ylang ylang and roses. Dzing! got up in a huff, dumping the cat from her lap. “I’m going upstairs to work on my cardboard sculptures,” she said, tattered kimono fluttering behind her as she charged up the hall, nearly knocking over Bandit. “For God’s sake, can you keep it down in here?” Bandit said as she pulled up a chair. She was wearing a short, black robe. “Diorling, would you live up to your name and pour me a cup of coffee? Black, please.” Bandit rubbed her wrists, which looked suspiciously like they’d recently been tied to a bed. Diorling looked at Bandit. “What have you been up to? Were you out again last night? You haven’t been, uh, you know…” as Diorling said this, she wondered if any of her sisters had heard the door click shut when her lover snuck out the back way earlier in the morning. “Oh, look who’s talking. You only wish Tom Ford reformulated you instead of creating a whole new scent and giving it your name! Besides, you’re nothing but a department store brand,” Bandit said as she plucked a stem of ylang ylang from the vase and crushed its stem in her fingers. A convertible pulled up outside and honked. Azurée leapt from her chair and headed for the front door, leaving a warm, herbal wake. “Well, I’m going for a drive to the coast. Don’t expect me back before dark. And you might want to do something about that hickey.” The last remark was aimed at Bandit. Note: images via Parfum de Pub. A soap opera for perfumes! The sad thing is that waiting for who will be discontinued next will actually provide me with much more suspense than an actual soap opera. Sadly, I have never tried Bandit – I ordered it in parfum near Christmas and it never arrived, thanks to the crack Canadian customs team that protects us Canucks from life-threatening sillage. But that Azuree, I love her. And I think a monkey *would* be hilarious! LOL! It's like those stories with perfume names I used to organise on MUA. I've still got them somewhere. This is more elaborate and to the point. Lovely! 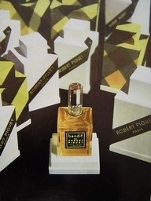 I ordered Bandit in parfum once, and when it arrived, the stopped was broken! The company that sent it to me didn't have any more left, but since then I've tried it in EdT. I do love a slug of leather. I'd love to read perfume stories! What a great idea to organize them. I'd love to read the stories–do you have a website? That made me laugh out loud: thank you for a delightful post! I'm glad you liked it! I was inspired to write the story when I was walking my dog and obsessively smelling my Diorling-spritzed wrist and marveling at the distinct personalities of leather scents. ROTFL! What a witty spot-on for Bandit! Angela, thank you for the delightful column! Now I have two more vintage frags to add to my every-growing “must try” list. I imagine that Cabochard and Yatagan *woud* make a handsome couple. I kept thinking of those Bandit ads with black leather and chains or knives or something like that (am I imagining this?) so Bandit had to be the tied-to-the-bed type. Angie, you ROCK! Brava! This was hilarious! A really short story with a well-developed characterization is the mark of a great writer *and* each paragraph just cracked me up! P.S. Which of them are you? Genius!!! Absolute genius! And I hope that your story inspires more people to move back to that fab neighborhood – the best in town, imo. I'd move there, that's for sure. Think of the neighbors: Cuir de Russie, Tabac Blond, Daim Blond, English Leather (well, my Dad used to wear it), and that's just for starters! Greetings from a long-time reader who's just commenting for the first time…thanks for such a witty and entertaining column! And double thanks for giving Azuree its due…I have always loved this fragrance, and feel it has never gotten enough credit. It deserves a place in the pantheon of great leather fragrances, but probably has been overlooked for its lack of snob-appeal. As far as I'm concerned, it can hold its own with any of its more exclusive relatives, and at $33 for two full ounces, it's an amazing bargain as well. I love the site- keep up all the great work! I almost forgot – a (belated) happy birthday to you, Miss A. Hope it was a really lovely one! Thanks for the birthday wishes–I did have a great birthday. You really need to try Dzing!. It's strange and wonderful, which in my mind is always a winning combination. Welcome to the site! I'm always amazed, too, at how Azuree is overlooked. I really think it could hold its own against any niche leather out there. It's so much more sunny than other leathers, like you want to be wearing it in a leather-upholstered roadster while driving in the summer, with a warm thyme and basil wind blowing through the windows. Do you think you have a good sample of the Azuree? I'm so surprised you can't pick up the leather. I'd be happy to send you a fresh one if you want to give Azuree another try…. Love it! Especially the take on Bandit. I always knew she was a naughty girl! Thank you! Yes, Bandi would have to be the naughty one–or at least the openly naughty one! Thank you — I am pretty sure they have it at either Saks or NM, I'll give it another whirl… if they don't, I know where to find you! You are such a silly ! This was a hoot ! Wonderful little story! I enjoyed reading it! Great story! The characterizations are spot-on. I especially liked the part about Dzing making cardboard sculptures! Yes, she does smell cardboardy, the papery variety of leather. Is the house next door for sale? or can I marry into the family, please? And if you move next door, can I visit? Or, if you marry into the family, please invite me to the wedding! I'll bring you a bottle of leather polish. I’m SO happy that you mentioned this @ the 5th b’day NST thread! I had never read it. I smiled through the entire story. Thank you Angela – you’re one of the wonderful reasons this blog is so fabulous. Thank you! You’re so nice. I’m so glad you enjoyed the story. I’m so glad you liked it! Thank you.